They say we have descended from apes, right? That makes a lot of sense when it comes to how hairy I am! I think I was meant to be a gorilla. I swear that if I did not shave my legs daily, I would definitely be quite the neanderthal. Blame it on genetics (thanks, Dad) or Mother Nature herself I admit it, I am hairy. My legs, my arms, heck, even my hands yield fuzziness and I am sick of battling it! Imagine my intrigue when I heard of the no!no! PRO I mean, a product that promised to allow me to not need to shave every single day? A product that would help me become less hairy? Count me in! How does the no!no! PRO work? 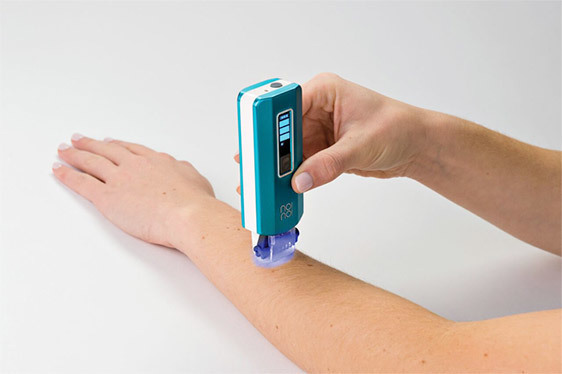 With three treatment levels and Pulsed Thermicon Technology, no!no! 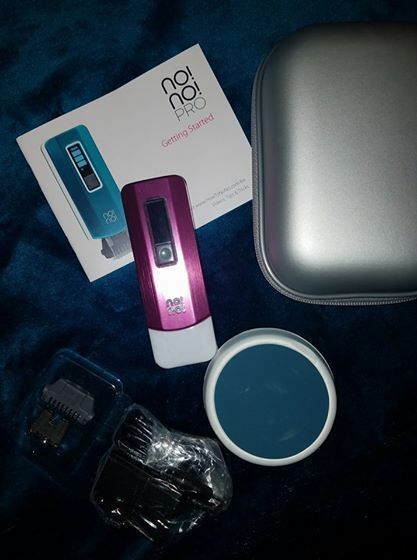 PRO is a hair removal device designed to give you immediate and long-lasting results with continued use. no!no! PRO keeps the skin cool, while simultaneously delivering a painless hair removal treatment. As with all no!no! products, PRO can be used virtually anywhere on the face and body. I was extremely excited to get started. I read all of the instructions and charged up my no!no! PRO in anticipation of this hopefully life-changing hair removing system. I had high expectations and nothing to lose except my 'bush-i-ness'. I started with my arms. I have always hated my arm hair. I started shaving me arms when I was ten years old because I got made fun of for having 'man arms' and that was definitely not because they were made of muscle! Nope! They were covered in dark hair, which really stood out thanks to my pale skin. As the directions indicated, I glided the device over the area I wanted to treat. I held down the button and heard a few clicks, and I realized that I was actually 'burning' my hair off, in a sense, but I didn't feel any pain. (There is an odor of burnt hair, but it is not bad once you get used to it.) Then, you buff it with the buffing pad it comes with, which smooths down any remaining stubble. I always use a good body lotion afterwards, too. My skin is left so very soft and silky smooth! After using the no!no! PRO just once on my arms, the hair has yet to grow back and it has been a month. Maybe it will never grow back? I wish! So in my quest to eradicate every unruly strand on my body, I was the most anxious to get rid of that ghastly leg stubble. I probably had more fun than I should have mowing down that field! To my surprise, using the No!No! on my legs was an easy task that I actually enjoyed. It felt eerily satisfying and after I buffed away the remnants of my leg forest, I reveled in the newly found softness of my legs. And they didn't even sting, nor were they nicked, as they often are after a tedious shaving session. The only thing I was disappointed in was that the no!no! PRO didn't help much with the bikini area, because, well, that is a coarser type of hair, but I am not giving up! The same is to be said of the underarm hair. I actually couldn't stand growing that out, even for a day! Gross! I felt very dirty. As for the bikini area~ I have noticed that the hair is finer when it started to grow back, so hopefully that is the start of a soon-to-be success story? Choose the appropriate Thermicon tip. Choose the appropriate Treatment level. Glide the Thermicon tip perpendicular to the surface of the skin in a single smooth motion. So, if you want a successful hair removing experience in which your skin stays baby smooth and hair-free for an extended time (think lazy hair-free summer days!) Then you must have patience and diligence and give the no!no! PRO a chance to work its magic. It will not happen over night, but you will get there. I am really loving the experience of having an alternative method of removing my unwanted body hair that does no include razors or razor burn, shaving cream, soap or water. It is an entirely new way of becoming hair-free for longer periods of time and certainly takes away the hassle of having to shave every single day. I am excited to be able to go camping and enjoying all kinds of summertime activities without having to worry about my unsightly body hair! Right now my readers can save 10% off! Just use the code NONOYT8 at checkout at nonopro.com!